Our company is based in Shenzhen, China. The brand is D1D9. In 2008, we began designing and making house alarm systems and smart products. D1D9 have a full range in home smart products. In 2015, the company is SHENZHEN CHAMBER OF E- BUSINESS, vice president of the association. Today our company have 10 research and develop engineer and 60 other employee. *WIFI/GSM//GPRS alarm system, support different alarm channels. like APP push/SMS/Call/Voice monitoring.to ensure the alarm performance stable and reliable. *2.4 inch TFT display screen, concise user interface and menu hint design. *Support up to 100 learning /storage location for remote control, RFID cards and wireless detectors. *Support many defense zones , such as gate, SOS, bedroom, window, balcony, perimeter. *Support the main power malfunction , backup power shortage, tamper alarm . *Support entry/exit zone, indoor zone, perimeter zone,24-hour zone, Doorbell Zone etc. *GSM Network clock synchronization, to ensure accurate clock ,and support country time zone setting. *Support 5 groups re-dial number. Do I Really Need A Home Anti Burglar Alarm System? According to Home Alarm System Report, over 2 million home burglaries are reported in the United States each year and, on average, a burglary of a home in the U.S. occurs every 13 seconds. whether invest in a wireless alarm system is the right decision for you? RIFID CARD Very easy for old people or children to arm or disarm this system. 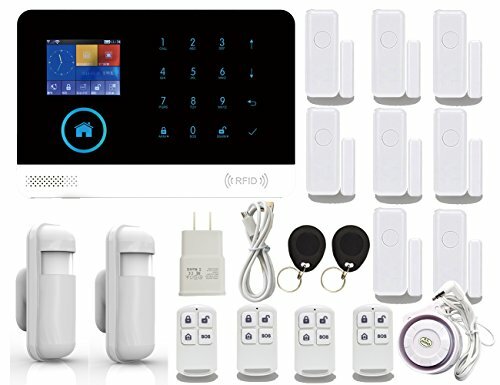 SCARE BURGLAR AWAY When someone trigger this system that will be alarm to scare thief away and also will make a phone or sending a message to someone which you save the phone number on the main unit. REMOTE CONTROL You can control this gsm alarm system Arm/Disarm/Voice Monitoring /Intercom by cellphone anywhere. BUILT-IN BATTERY This system work well when someone cut wires or power off. You don’t worry other people intrude your house when power off. GOOD AFTER SERVICE We answer your all question by our product engineer within 1 day. Reply question profession and solve problem quickly.